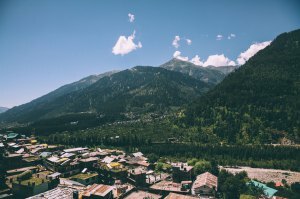 An Indian town in the Kullu Valley, Manali has a population of approximately 18,000 and is accessible by a single (snow closed) road that follows the Kullu Valley, or by air from New Delhi, Shimla or Chandigarh, landing at Kullu airport 40 km downstream. Tourist town located at 2000 meters above sea level, Manali is a ski resort appreciated by Indians for its freshness, but also a starting point for many destinations, with sumptuous landscapes of forests and waterfalls. The traveler will be able to visit several sites in Manali, like the temple of Hadimba, built in 1553, placed in the middle of the forest, or that of Siyali Mahadev, in the city center, all in wood and very nicely decorated, dedicated to Shiva; You can also enjoy the easy three-hour hike to the Vashish hot springs, or to Old Manali, a very picturesque village with its wooden houses and rapeseed fields. Outdoor enthusiasts will be delighted and will be able to practice, in addition to walking, rafting, mountain biking or crossing the rivers zip line. Finally, Manali is on the "road of the gods" that leads to Leh, the capital of Ladakh, which is the second highest road in the world with its passes that exceed 5000 meters.